FILE - In this April 4, 2018 file photo, a U.S. soldier sits on an armored vehicle at a newly installed position, near the tense front line between the U.S-backed Syrian Manbij Military Council and the Turkish-backed fighters, in Manbij, north Syria. U.S. officials said Tuesday they will keep working to stabilize areas they helped liberate from Islamic State in Syria and Iraq. With IS's so-called caliphate crumbled, the U.S. and its allies now seek long-term solutions for the region, emphasizing that the next phase will focus on providing local partners the means to ensure sustained stability in areas previously held by the terror group. 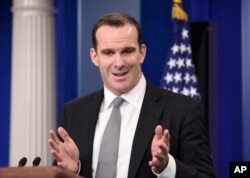 Brett McGurk, special presidential envoy for the global coalition to counter the Islamic State group, speaks during the daily briefing at the White House in Washington, June 10, 2016. “The theme of the day is the conventional fight. While not over, we can see the endpoint,” Brett McGurk, U.S. special envoy for the Global Coalition to Defeat the Islamic State of Iraq and Syria, told reporters at an annual meeting in Washington on countering violent extremism. The International Chiefs of Defense for Counter-Violent Extremist Organizations Conference was hosted by Gen. Joseph F. Dunford Jr., chairman of the Joint Chiefs of Staff, with representatives from 83 nations, including commanders of counterterrorism operations from the U.S. and around the world. “I think we all recognize that violent extremism is a generational challenge that demands we develop solutions that are politically, fiscally and militarily sustainable,” Dunford said in his opening remarks. 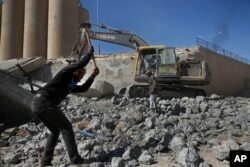 The U.S. is a major donor to peace building and stabilization programs in Syria. But in mid-August, the Trump administration announced cuts of about $230 million in stabilization funding to northeast Syria, saying it would instead rely on financial contributions from countries such as Saudi Arabia, UAE and other members of the anti-ISIS global coalition. McGurk noted that these nations have so far announced $300 million in contributions, which have helped stabilization programs in Syria. In this April 5, 2018 photo, workers remove rubble of a bridge that was destroyed last summer during fighting between U.S.-backed Syrian Democratic Forces fighters and Islamic State militants, in Raqqa, Syria. With the help of the U.S.-led coalition, Kurdish-dominated Syrian Democratic Forces freed the Syrian city of Raqqa — IS's former de facto capital — in October 2017 after a four-month-long battle. One year later, locals say U.S. assistance has been instrumental in rebuilding their city. “The United States was a major force behind the liberation of Raqqa from ISIS, and ever since, it has been helping us rebuild our city through funding various local organizations that work in different projects,” said Abdulsalam Hamasork of the Raqqa Civil Council, the governing body in charge of running Raqqa. According to U.S. officials, stabilization efforts have helped 150,000 Raqqa residents return to their homes. “The U.S. funding is effective because it is targeting communities and areas that were hit hard by IS and its extremist ideology. What we have in Raqqa has already been happening in other areas that were previously under IS rule,” Hamasork told VOA in a phone interview. 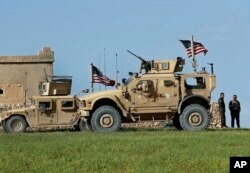 In this picture taken on March 29, 2018, a fighter, second from right, of U.S-backed Syrian Manbij Military Council stands next to U.S. humvee at a U.S. outpost north of Manbij town, Syria. In the northern Syrian town of Manbij, local activists see how the U.S. focus has gradually shifted from military assistance to supporting civic initiatives. Manbij was cleared of IS militants in August 2016. “With the cooperation between local forces, the majority of U.S. funding here goes to education and health programs,” said Sadam al-Haman, a journalist with the Manbij Media Center. “This has encouraged more displaced people to return to their houses in the past few years. It has also been effective in eradicating IS’s radical ideas, particularly among young people who were forced to be indoctrinated when the terrorist group ruled our city from 2014 to 2016,” he added. But some analysts say it may take a long time for stabilization efforts to help local communities in areas formerly held by IS fully recover. “Raqqa has not seen much rebuilding, although some schools have been cleared, electricity restored and areas successfully de-bombed,” said Joshua Landis, director of the Center for Middle Eastern Studies at the University of Oklahoma. “The U.S. has always drawn a distinction between stabilization and rebuilding, although it may be a difference with little real distinction, because so long as lives are not rebuilt in Raqqa, the likelihood of further violence remains,” Landis said. Security forces patrol in Basra, Iraq, 340 miles (550 kilometers) southeast of Baghdad, Sept. 8, 2018. In Iraq too, U.S. officials say their efforts continue to help the recovery process. Such efforts include training over 170,000 members of the Iraqi security forces. “We had a good presentation today from the commander of the new NATO Training Mission to Iraq that will continue to professionalize the force,” McGurk said in his Tuesday meeting. The U.S. announced Tuesday that $178 million would go to Iraq to help local communities that were impacted by the IS fight. “The governance component of stabilization programs is essential,” said Bilal Wahab, a researcher at the Washington Institute for Near East Policy.